It is said that everyone has a book in them. Certainly in my experience this appears to be true. When people ask what I do for a living, and I tell them I’m a writer, most will inform me that they’ve always wanted to write a book. Some even tell me what the book is about. Most will admit that they really want to write the book … but simply don’t have time. It’s at this point that I roll my eyes. I don’t mean to. (I apologise if I’ve done it to you.) But am I one of those blessed people who was born under a 24 hour clock while others got ripped off with only 15 hours a day? How can I find time to write when others can’t? Or is it possible that everyone has enough time to write a book? I understand that everyone is busy. I am too. I run a business. I’m raising four boys. I also have a massive problem where I love a clean house but don’t have a cleaner … I’m thinking about making all my sons live in one room only, which will cut down on housework. Life is a constant juggle, but I jam as much writing as possible into any spare minute I can. I write when my sons are asleep. Or when I’m waiting for my kids to finish jujitsu / swimming /drums. While other mothers chat, I sit in the corner and edit pages. I regularly stare into space as I ponder how to move forward with my plot (no doubt many people think I’ve lost the plot). There is always time for that book if you really want it. Do you watch TV? Turn it off. There, you have time. Spend hours on the Internet? You could be writing. Do you commute to work? I have a friend who writes all his novels on the Tokyo subway. Naturally there are certain things I’ll never find time for, despite knowing I should. I’ll never find time to volunteer for canteen shifts at my son’s school. I’ll never find time to clean up my iPhoto, or make proper albums for my kids, or write in my diary, or read A Course in Miracles, or clean out the front shoe cupboard. But anything I’m truly passionate about, and anything I really want to achieve … well there’s always plenty of time for that! We thank the writer for taking time out to write such a passionate piece for us in spite of her hectic schedule. available on Amazon. Jane lives with her partner Dom and their four sons in Sydney, Australia. Before I get to the Review: SPOILER ALERT! The story picks off from the last book (The First Pillar (Everville #1)) - With Owen and Fron winning the first battle and Dante going to a vegetative state as an unexpected consequence. Owen's mission now seems to be fighting the evil Them who are determined more than ever before and repairing the breach. The writer,as promised has answered as to why Owen and his friends were in first place were chosen to restore the balance between good and evil and repair the breach. Owen now clearly knows who his "Friends" and who his "Enemies" are. I can safely say the writer has matured since his last book. The story line essentially emphasizes on a very basic fact that our choices dictate the person who we really are - Good or Evil. The protagonists of this book seem to be delivering that message bang on. The climax of the book really surprised me. It’s a perfectly unexpected twist for a plot that was near predictable till that twist came along. VERDICT: Give it a read. Read the first in the series before this. ABOUT THE AUTHOR :: Roy Huff is the author of Amazon's #1 international bestselling epic fantasy novel, Everville: The First Pillar as well as the newly released Everville: The City of Worms. These are the first installments in the remarkable Everville series which combines elements of epic fantasy and young adult fiction in a form that nearly anyone will enjoy reading, young or old. He is a man of many interests including but not limited to science, traveling, movies, the outdoors, and of course writing teen and young adult fantasy fiction. He holds five degrees in four separate disciplines including liberal arts, history, secondary science education, and geoscience. Roy Huff's background includes work in art, history, education, business, real-estate, economics, geoscience, and satellite meteorology. He was born on the East Coast but has spent more than half his life in Hawaii, where he currently resides and writes his epic fantasy saga. In the quest for books! One of the real treats of the city is its abundance of activity. Quaint old buildings coupled with modern skyscrapers, the city has its charm for tourists. But there is the quiet corner of the city's inhabitants who are neither moved nor awed by the various treats of the city. Their aim, goal and destination are one of the numerous book shops that are aplenty and scattered all through the city. These treasure troves are situated in nooks and crannies of the city, where only the regulars feel comfortable. My recent quest for books started when my dormant bookshelf stared at me alarmingly one morning. I realised my supply of paper backs was dwindling and therefore I just went through the books I had been reading and re reading. And finally I realised that another trip to my comfort corners was due. So with determination I set off toward the local book shop which sold second hand books at a deal. My mind was busy listing all the authors I would like to read and I have not yet had the chance to come across. Before long I found myself at the platform where the familiar sight of books pleased me like an appetising display of chocolate cake! (No food references allowed, I guess, I will move away from the topic). There was some unidentified happiness blossoming at the sight of the old uncle who managed the bookshop greeting me with a smile. And his innocent enquiry as to why I had not dropped by for six months to which I just shrugged. Mumbling flimsy reasons and of course the clichéd "I have been busy and had no time..." I proceeded to check out what he had on display. Seeing the books stacked in the display board in neat orders gave a strong wave of nostalgia. Much like greeting old friends, I soon made myself at home and started my determined ploughing through the rows and rows of books. I knew my way through the racks and the books stacked according to their prices. I talked as I searched and belted out the names of authors I had in mind. Uncle speeded up and brought out 6 of the ten books I named. The other four books, he promised to have ready and call me when they arrived. But I was far from disappointed. This uncertainty is the charm of these bookshops. You can never get every title you have in mind, but as I soon discovered, (Once again, every time, it happens always.) I started choosing books I had never thought about. Before long the 'helpful' uncle started taking out packed crates with a grunt and a resigned sigh, with his almost clichéd, 'these display books are never enough for you. Here, these books might interest you'. I couldn't help the reluctant grin that spread across my face as I remembered the initial days when I mistook this gesture as a ploy to sell me more books. But before long I understood that the uncle was choosing books based on my favourite genres. He was, contrary to popular belief, quite knowledgeable about the various authors and books and the general trend and mood of the other patrons. Knowing that his suggestions were almost always good, I proceeded to dust out the books out and discovered fourteen more books "I just had to buy". The ever helpful owner provided a grand total and discounts. But still, the sum far exceeded my budget and I had to part with a few. This filtering process is the hardest. You never know what to take and what to let go. Finally I chose a few books that I couldn't avoid. And with requests to keep those aside for another day, I finally totalled the books and loaded my treasure in the bag I readily carried. The uncle fervently nodded and assured me that he will set those books aside and I knew he would. The number one benefit of frequenting a local shop is that you can get such concessions. So I filtered out the six books, which in addition to my earlier six made a total of twelve, and kept aside four books with promises to return. The weight of the books was a comfortable load on my back as I trudged my way back to home, much richer than I was before. I came back home and bragged about my exploits and made my mother go 'oh no. Not again' but with a smile on her face. In another two days I had forgotten my trip to the bookshop and pushed the books I had kept aside to the back of my mind. They belonged to the 'near future'-- one other weekend when - no, If- I found the time. So with this totally unprepared mind I trudged home after a long day at office. And lo and behold what do I find? But the four books I had meant to buy. Knowing every book I own by heart and understanding that these four books here couldn't be a lucky coincidence, I stood staring at them in awe. My mother came forward with her usual won't-you-ever-get-enough-of-this stare. I tried a tentative puppy face and grin while she just shook her head and rambled on, "The book shop man told me you had kept aside these four books. So I just thought I must pick them up before someone else does." I could see her stern expression slowly morphing into an indulgent and understanding smile. But her next words were lost in the bear hug I gave her. And oh, did I mention? There is another benefit of purchasing at your local shop; the shop owners are familiar with your whole family, and who knows? Your surprise book package may arrive with your mother or the not so distant cousin whom you introduced to that uncle once. The pleasure of passing on a legacy, I say! HOW I GOT THIS BOOK: Another net-galley offering. 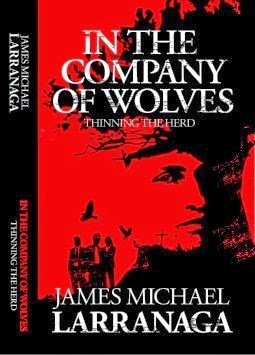 A thrilling novel set in the backdrop of corporate companies, a cold climate and even colder criminals and a deranged protagonist, ‘In the Company Of Wolves’ proves to be a page turner for odd reasons. Much like a cloudy evening with a slight mist, the book moves at a slow pace but still manages to interest the reader enough to be a page turner. Hallucinations are the main concept dealt with in the book. The protagonist is joining his job as an intern on the prestigious viatical settlement firm. He soon learns more about the job than he bargained for. With thrilling comparisons to the wolf pack, the insurance world and its inhabitants are just as calculating and shrewd as a pack of wolves. There is the alpha boss, his beta right hand security man, and the underdog omega wolf that is looking for a chance to prove his mettle to the leaders. On his first day at his new job, Quin Lighthorn witnesses a death—unsure whether it was a murder or a forced-due-to-circumstance shooting. The mirage of safety slowly dissolves as more and more secrets of the company are divulged. The mysterious disappearance of two former employees at the company is still not investigated and the company is busying itself to capture a big settlement worth ten million dollars, looking for investors who would cash in on the life insurance of an already dying person. The protagonist finds too many warning calls from mysterious ravens that appear only to him and he decides to play the Good Samaritan to the lady whose policy is being fought upon. Because of one secret he knows, or rather suspects. Convinced though he is that he is doing the right thing in protecting her, the subject proves to be difficult to convince. Sooner than he imagined, Quin is asked to find investors for the big settlement and he chooses to cash in on this opportunity. WHAT I LIKED: the thrilling scenes, setting, insights into the Indian culture, delusional but do-gooder protagonist, excellent placement of twists scattered throughout the book. WHAT COULD HAVE BEEN BETTER: confusing storyline, unsatisfying finish (but quite practical), teetering towards the surreal sometimes. VERDICT: read this one on a thoroughly rainy afternoon if twists and page turners are your forte. Wait for the sequel for better grasp. EDITIONS AVAILABLE: e-book, Adobe DRM.